From time to time I get sent a few lines telling why visitors named their cats (Siamese or otherwise) the way they did. These shorter submissions aren't quite long enough to give each one a page to itself, but I didn't want to lose the stories, either. So here they are - more names for Siamese (or other) cats and kittens. Thanks to all the contributors who sent them in! Aurora means Sunrise in Italian. She paws at my face to get underneath the covers every night, cuddles in my arms at night and is the first thing I see in the morning. 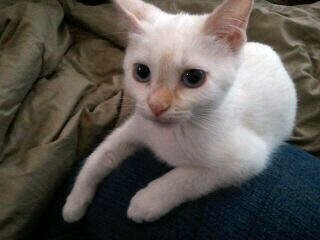 Azure was named for her pretty (and huge) light blue eyes, which are shown off beautifully in the picture below. Buffy is after Buffy the Vampire Slayer. She chose us, grabbing my husband's shorts as we were playing with some young kittens. They are not related but are both mixes of seal and chocolate points. (Jake is darker like a seal and Buffy is more chocolate brown). When we found him, he had a very "presidential" look to him. 'Cleveland' was the only presidential name that really seemed to fit, so it stuck. I named my cat after Casanova, because Giacomo is such a lover, but I chose Casanova's first name. Since I usually call him "Giac", most people think I am using the French version, Jacques, so first I have to explain the name ... and then spell it! Istas is Native American for snow. It was snowing the day we brought Istas home. I struggled for days to find a name for her. Then my (then) three year old came to me and told me that the kitty was watching the snow fall at the window and it hit me...SNOW! But I didn't like just Snow. So I looked up different languages and decided that Istas was perfect, since it keeps to my heritage and fits her perfectly as well! Takota is Native American for Friend to All. He was harder to name than his sister. It took me a week to name him. I searched the web, picked my friends' brains, searched my own soul and finally sat down with a Native American baby book and opened it, closed my eyes and pointed. Thank goodness I pointed at a boy's name, and one that is easy to pronounce! LOL! Takota loves his name and comes running when he is called! I named my cat Mo because of her personality. She is fun and sweet. I was going to name her Princess but I tried Mo and it stuck. I also chose the name Mo because she is unique and so is the name Mo. Mr. Myaggi, my cross-eyed lynx point, came to me as a stray, with bilateral eye infections that were so bad I had to soak his eyes open every morning with moist paper towels. And he just let me. Guess he knew he was a sitting duck without sight. After a couple of different eye meds from the vet, my twenty-year-old son and I got a good look at his eyes. My son exclaimed "Mom, he looks just like Mr. Myaggi! ", the Karate Kid character. So that was his name. I have had him about five years now, and he is so loving that I recently began doing pet therapy with him at a local long term care facility. They love him, especially when he rides in the 'pet stroller'. Seb and Pepe - two seal points. They lived with my wife and two children; a Weimaraner X, Teena; our 10-year-old female moggie, Nohi (which means curious in my native language); and a huge 5-year-old ginger male named Rufus. Rufus was a bully and a boffhead because he couldn't work out which of the Siamese always bit his back legs come meal times! He'd just attack the nearest one which was most times Pepe - always the wrong one! Seb and Pepe both had their own characteristics, really just like chalk and cheese. 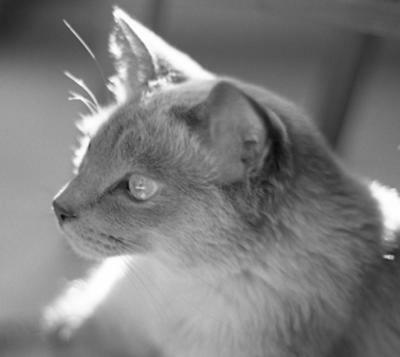 Seb was always regal in his demeanour, and great company. Pepe was naughty, opened cupboards, loved to steal pasta even with the pot lid on, got stuck up trees. Seb loved to sleep under the blankets, Pepe loved to poke himself just under, with his face out, he hated his ears covered. Seb liked mashed potato, deep fried chips, potato chips. Pepe didn't. He liked pasta (raw or cooked) and would wind himself up when the chicken came out for tea! Sierra's chocolate point ears reminded us of the mountains, and we liked the slightly girly name for our little girl kitten. 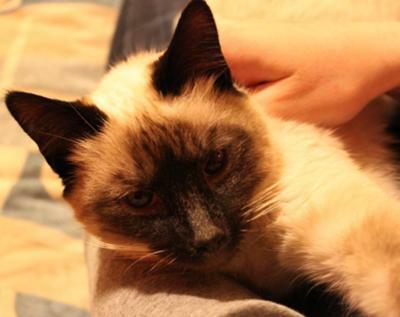 We like that the name comes from the Bible, and we thought Simeon the Siamese sounded really cute! But we also often call her "Tinky", because it's simpler to call. My first choice would have been "Miss Marple". My two four-legged loves are called Tao and ZuZu. Tao is about 2.5 years old, rescued by my sister and brought to me (Oh happy day). He is a very affectionate Lilac and is always close by. ZuZu started out to be called Zelda, but it just didn't suit her. She answers just fine to her new name. She is a Tortie, just a little over a year old. She is also a foundling under a bush, weighed in at a hefty 1lb 2oz when she came to me. She is the typical Siamese who will let you know when she wants to be petted.